← The Contemplation of God through the Contemplation of God’s Creation. Venus and Spica continue their predawn conjunction in the southeastern sky. Venus near the star Spica in the predawn sky, Nov. 27, 2018. Credit: Stellarium / Bob Trembley. Mars is high in southern sky after sunset all week. Mars is high in the southern sky after sunset on Nov. 27, 2018. Credit: Stellarium / Bob Trembley. The International Space Station will pass very near Saturn low in the southwestern sky at 5:42 PM ET on Nov. 27th. The International Space Station passing near Saturn low in the southwestern sky at 5:42 PM ET on Nov. 27, 2018. Credit: Stellarium / Bob Trembley. ISS flyover passing near Saturn on Nov. 27 2018 around 5:42 PM ET - visible from southeastern Michigan. The nearly third-quarter Moon will appear very near the star Regulus in the southeastern predawn sky on Nov. 29th. The Moon near the star Regulus hight in the southeastern sky at 5:00 AM on Nov. 29th. The Moon is a waning gibbous, rising after sunset, high in the sky after midnight, and visible to the southwest after sunrise. On Nov. 30th the Moon will be at third-quarter, rising around midnight, and visible to the south after sunrise. Starting in December, the Moon will be a waning crescent, low to the east before sunrise. The Moon from Nov. 27-Dec. 3, 2018. Visualizations by Ernie Wright. Vlosw-up of fading sunspot, Nov. 27, 2018. Credit: NASA/SDO and the AIA, EVE, and HMI science teams. Spaceweather.com claims the Sun has been spot-free for 1 day; I'm going to challenge that with this SDO close-up from Nov. 27th - There are two dark areas that happen to coincide nicely with the bright active region on the Sun's equator in the animations below. They ARE tiny tho, and fading fast. Coronal holes are still open at both poles; a large ">" shaped coronal hole is rotating into view, and a smaller equatorial hole is rotating out of view. SpaceWeather.com says "Geomagnetic storms (G1-class) are likely on Nov. 30th or Dec. 1st when a stream of solar wind is expected to hit Earth's magnetic field. The gaseous material is flowing from a large hole in the sun's atmosphere. This is a long-lasting hole that has lashed Earth with solar wind about once a month since July. The last time it happened on Nov. 4th, auroras were sighted in multiple northern-tier US states." 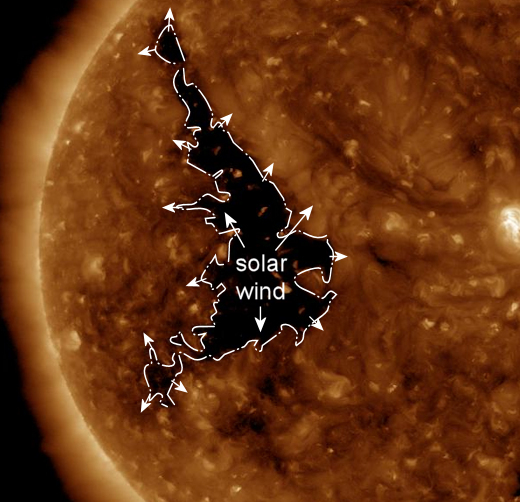 The solar wind speed is 372.4 km/sec, with a density of 8.5 protons/cm3. A "sundiver" comet can be seen in this Solar & Heliospheric Observatory (SOHO) video from Nov. 24, 2018! When I was working on the Sun portion of this post (above), I noticed that the live-feed from NASA's Solar & Heliospheric Observatory (SOHO) showed a comet plunging in to the Sun! The SOHO website has a movie gallery of comets that have grazed the Sun and flown-by, and some others that did not survive the encounter. You can "observe" these comets from the comfort of your office or living room. Sungrazing Comet & Venus from LASCO C3 (Jan. 3, 2010). Near-Earth objects (NEOs) discovered this month: 184, this year: 1806, all time: 19204. On Nov. 26, 2018, the NASA All Sky Fireball Network reported 29 fireballs. This is the position of the planets and a couple spacecraft in the solar system; The Parker Solar Probe has recrossed the orbit of Mercury, and InSight has successfully landed on Mars - more below! Position of the planets in the inner solar system, Nov. 27, 2018. Credit: NASA Eyes on the Solar System / Bob Trembley. Position of the planets in the middle solar system, Nov. 27, 2018. Credit: NASA Eyes on the Solar System / Bob Trembley. Position of the planets in the outer solar system, Nov. 27, 2018. Credit: NASA Eyes on the Solar System / Bob Trembley. Mars InSight - Lands Successfully! Happy mission control specialists and engineers are happy! This NEVER gets old! I LOVE that they are all wearing custom logoed shirts! I think this needs to become "a thing" with NASA missions. The first image from the surface of Mars was returned in mere moments; I'm not sure if this is a tradition or what, but the first image returned for the last few landers seems to be the "dusty lens cover view of the horizon." The two MarCO CubeSat attendants preformed perfectly; you can expect to see more spacecraft like them in the future. It now takes nearly 14 minutes round-trip for me to communicate with my team back on Earth. 🛰 ↔️ 📡 My light time will increase as I approach #asteroid Bennu and will be more than 20 minutes during sample collection.